It was a one in a million chance. During the second exposure, a huge bolt of lightning split the sky - directly in the middle of the frame. And this is how it turned out. I find it amazing that I was able to get such a good shot on just the second try. The lightning is streaking through the darkened sky, ending in a flash of electricity near the ground. A dead tree stands in stark silhouette against the backdrop of dark purple clouds. The pitch black of the surrounding terrain serves to intensify the scene, as well as provide a natural frame for the action. It just goes to show: don't rely on the tried and tested methods, do something different and strange - it might just work out! This is an awesome capture ! Lightning photos are never easy to capture, and you need to be at the location and ready to capture the lightning across the sky. Great skills ! Do check out some of my pics in flickr on my Aussie adventures, was there in UQ from 1998 - 2002 ! Added you to my blog too ! Glad you are happy with the setup. Look forward to seeing some more of your photos soon. I appreciate your explanations of how you get your shots. I have so much to learn and it helps to know just exactly how an image was caught, such as this lightening streak! Thanks for the nice comments on my blog! I added you to my blogroll and see you did the same for me! I'm glad to help anytime, it's good to see that I could be of some assistance. I thank you too for the nice comments you're leaving on my blog - it's always great when the readers participate! have you ever wondered whats that which makes you go for such unique ones? Just keep taking photos, looking out for strange things, try to imagine everything as if it's seen through the eye of a camera, and I'm sure you'll come up with a few great unique photos. Remember the old saying: Practice makes perfect! p.s. Remember too, that many of the best shots are taken by accident - even this one wasn't exactly planned the way it turned out! "expect the unexpected" -- mostly memorable moments just happen. No doubt professional expertise coupled with practice takes you to the peak, yet, its the connectivity call it Divine will, Grace that lets it happen. Exactly my thoughts, it is mostly through "Grace" (also called "chance" by some people) that shots like this come about. No matter how much expertise you have, you'll just have to wait for the right moment to get a shot all the same! I know what you mean. That's exactly how I felt in the past when I tried to get lightning shots. Somehow this shot just turned out perfectly - after years of trying with long exposures and other tricks, one 2-second exposure turned out better than all the rest! Thanks for visiting, it's nice to meet someone else who is in the same field. My advice if you want to capture lightning - keep trying. Eventually, you'll get a good shot. It might take 1 try, it might take 100, but you'll get it if you keep trying. 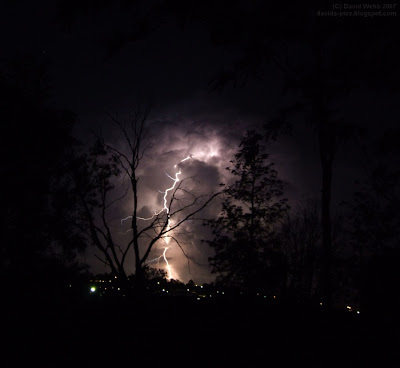 This piercing lightning/dark sky photo would make the most awesome book cover!!! I never thought of that, but it certainly would make a great book cover. I love this one! You need to join the buzz. It is invite only and I am sending you one. Lots of great photographer bloggers network there among other bloggers as well. Great stuff! Thanks for your comment and the invite. I'll check out the buzz and see what I can do. See ya soon! I have heard of a device like you mentioned, but I don't know the name either. It certainly would be useful, I might try to look it up. Otherwise, you have to leave the chance of getting a shot at the right time to providence - although that's what came up with this shot! Ooh, what a wonderful capture!!! Great Lightning shot! At two seconds that is definitely a blinder of a shot. I have been out for hours at a time doing 15 - 30 second frames and still struggle to get good ones. You need to have someone up above shining down on you to send one just at the right time. Hes definitely done that for you this time! This is certainly an amazing opportunity for a photo. I can't help but think, like you, that I've had some help from above to get this shot. Thanks for sharing. I never have had luck with lightning. Almost hit by lightning once. Once scared, twice shy. It his about 100 ft. away and made all my hair stand straight out. Like you said "Once in a million". However, if you don't try you wont get the shot. Once I think I had lightning hit the house. I was inside during a thunderstorm, and was just about to go outside, when suddenly there was a huge flash that seemed to split the house in half, and a boom which was really more like an earthquake than what you normally hear from a lightning bolt. You could really feel, rather than see or hear it. Needless to say, I didn't go outside! Anyway, we had a satellite dish up above the house, and everything connected to that was fried, which made us think that it hit the dish. Just keep trying and one day you'll get a great shot. I'm still trying, but we don't get many storms here, so it's a bit difficult! I have yet to capture lightning, one day, when I have a better camera. Have a great weekend! The Cloud on the back of the lighting make this picture more powerful. 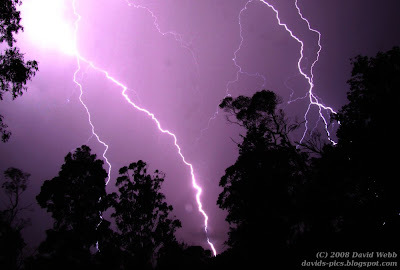 The only real requirement of a camera for lightning is that it have slow shutter speed capability. Even that isn't a requirement, but it makes life a lot easier. Just sit the camera there on it's longest shutter exposure, and keep taking photos until you actually catch some lightning on camera! I agree, the clouds are a key component of this picture. Thinking of it without them doesn't seem anywhere near as powerful. I would title this "Dance of Light and Dark in a Storm." Great shot!